The main forecast challenge during the medium range period is the evolve and speed of the southern stream closed low over the southern plains, beginning Wednesday morning. The 6Z GFS and the 6Z GEFS mean are about 250 miles east of the UKMET/ECMWF/CMC/EC mean solutions at that time, and these differences become greater by Friday morning as this feature reaches the East Coast, with the GFS ahead of the GEFS mean by Thursday morning. The 00Z GFS, while still faster than the model consensus, is not quick as progressive and depicts a more reasonable solution. Given the greater model agreement on a slower track, more weighting was given to this scenario in the WPC forecast, with only a small percentage of the 00Z GFS being incorporated and no 6Z GFS. There has also been a trend for a stronger East Coast surface low by the end of the week compared to earlier model guidance, and the latest WPC forecast reflects that. Current pattern good for storms, not great for synoptic snows. Dual core lps with one being over the lakes loaded with waa, especially this early in season is a deal breaker. imho we need the Atlantic to block up and rise the heights downstream, wavespacing a tad too close for any significant North Atlantic block to form. Don’t necessarily need high latitude blocking or a -nao. Just something to pump the heights along the Atlantic coast a bit more. the 12Z EMWF run may turn out to be a very interesting run. 990mb low just south of NYC. Verbatim - time of day for precip (in addition to elevation and inland aspect) could make for wintery surprise along and to the west of the front range Apps. NAVGEM is oddly slower. Otherwise same idea. JMA keeps it further south and kicks it east. these solutions don’t close the left over energy left behind at h5 and essentially allow it to smack into a bunch of confluence which allows the setup to hold off any waa. Also possible factor is because it seems to time as happening at night - CAD could hold stronger than if during daylight hours. As always a middle ground solution is probably the best bet, one where some winter precip is seen on the westward apps and at elevation. A climatogical sound solution. Im up for some mood flakes. 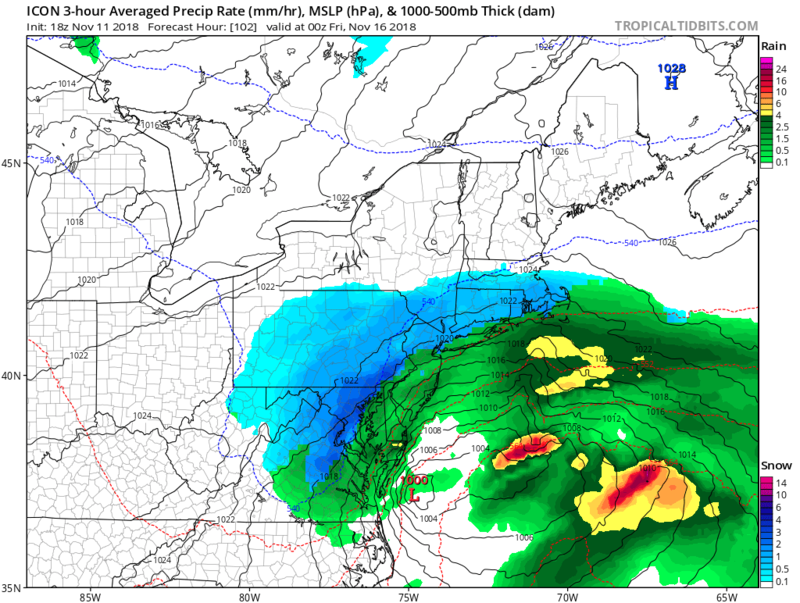 0z NAM was looking good. not sure if long range nam and icon are the best 1,2 punch but weenies out!